It might take years of scheming, tunnel digging, and power tool smuggling to break your smartphone free of Quad Lock’s widely regarded mounting system. Their iPhone 7 Bike Mount Kit makes using an iPhone to navigate, track fitness, or view notifications while riding a simple and secure process. Included is Quad Lock’s Bike Mount Pro that attaches to stems and handlebars with removable O-rings or a more permanent zip tie attachment. The slim and robust phone case perfectly fits Apple’s iPhone 7 and has the compact Quad Lock mounting mechanism built in on the back. Just set the phone at a 45° angle and twist to secure it in either portrait or landscape orientations. Your phone is coupled into the rock solid Quad Lock system until you pull down on the blue collar while simultaneously turning the device to release it, thereby preventing any accidental ejections no matter rough of a ride you put it through. 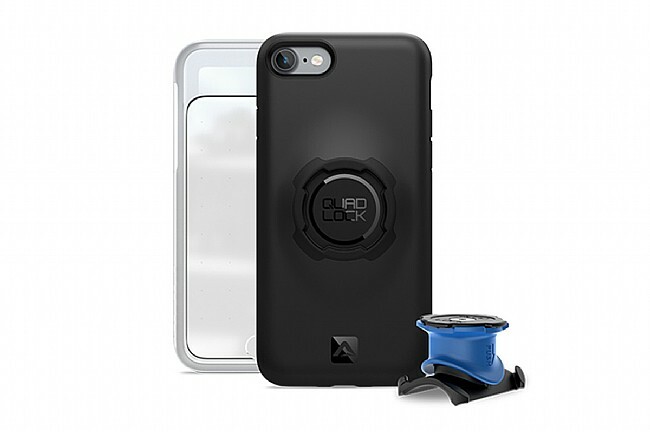 Off the bike, the Quad Lock Case is slim enough to still fit easily into a pocket, and the composite construction is both grippy and provides edge-to-edge protection. With the low-profile mounting mechanism built into the case itself, it means it can be universally adapted to any of Quad Lock’s other mount options, such as those for running or driving. Compatible with standard size iPhone 7 devices only. Kits for the iPhone 7 Plus and other smartphone models are available separately. Bike Mount Pro mounts to handlebars 25 - 40 mm in diameter. I had been using rubber bands to hold my iPhone on my bike while riding my trainer on rainy days and decided I would get this device. It was more than I wanted to pay but very much worth it. It has a very secure mounting system that mounts the phone to the bar and a clear plastic cover the keeps the weather out if you decide to use it while you ride outside.